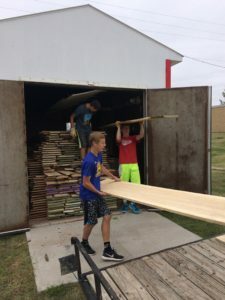 High school woodworking students have milled more than 6,000 board feet of lumber thanks to a new mill purchased with a grant from the Hansen Foundation. The new mill has not only benefited the school program, but has also community members, and folks from five different communities who have rented time on the mill or kiln. The revenue has helped pay for a new shed to house the equipment, a concrete slab, and other planned improvements for the wood processing program. Families who have students in the woods program have been able to either buy wood from the school at a lower cost, or have been able to bring in logs from their own farms and mill them into lumber at cost for their student to use. Some families have brought in trees with sentimental value, either a grandparent planted the tree, or sibling who had passed away, enabling them to build something from that wood that they can hold on to.